ESSM Le Portel Cote d'Opale (ProA) is close to ink 32-year old former Burkinabe international power forward Jean-Victor Traore (204-85) who currently plays at Lille Metropole Basket in French ProB. Traore has played there for the last three years. In 36 ProB games he averaged 12.7ppg, 7.6rpg, 2.9apg, 1.4spg and 1.1bpg this season. The last season he played also at Lille Metropole (also in ProB) where in 36 games he had 11.8ppg, 9.5rpg (#5 in the league), 2.0apg and 1.2spg. Traore helped them to make it to the French ProB Leaders Cup Semifinals. A very good season in his career as he was selected to Eurobasket.com All-French ProB Honorable Mention and All-Domestic Players Team. Among other achievements his team made it to the ProB Play-Offs Semifinals in 2014. Traore received also Eurobasket.com All-French NM1 Domestic Player of the Year award back in 2011. He was a member of Burkinabe Senior National Team between 2012 and 2013. Traore has played previously for four other teams: ALM Evreux, Chalon/Saor, Angers BC and Longwy. His game is described as: An athletic PF who has a slim body but is very effective near to the rim. NM2 newcomer Villeneuve sur Lot Basket Club strengthened their roster with addition of 33-year old Burkinabe ex-international power forward Mohamed Traore (201-85). He is not a newcomer in French League as he played last season at St-Just Pontoise in the NM3. The previous (16-17) season Traore played at Valence Condom Gers Basket. 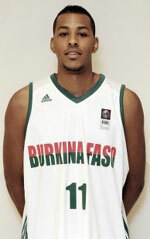 He also represented Burkina Faso at the Afrobasket Championships in Abidjan (Ivory Coast) five years ago. His stats at that event were 3 games: 2.3ppg, 1.7rpg. Traore has played previously professionally also in Burkina Faso (Rail Club Kadiogo and AS Sonabel). La Charite Basket 58 (NM1) agreed terms with 27-year old Burkinabe international swingman Joris Bado (193-91). He has played for the last two seasons at played at BC Montbrison Masculins in the NM2. Bado also represented Burkina Faso at the Afrobasket Championships in Abidjan (Ivory Coast) five years ago. His stats at that event were 5 games: 9.4ppg, 1.6rpg, FGP: 55.0%, 3PT: 53.8%, FT: 50.0%. Bado has played previously for three other teams: Cognac BB, Prisse Macon and Poitiers. Sharks Antibes (ProA) tabbed 29-year old Burkinabe ex-international center Louri Frejus Zerbo (208-89). He has a double citizenship as he also holds Ivorian passport. Zerbo started the season at Limoges CSP Elite (ProA). He has played there for the last seven years. But in 7 ProA games he averaged just 1.6ppg and 2.6rpg this season. Zerbo also played 6 games in Eurocup, but he did not score anything and had only 4 rebounds. The last season Zerbo played also at Limoges CSP Elite where in 34 ProA games he recorded only 2.8ppg and 2.9rpg. Zerbo won French ProA championship title in 2015. 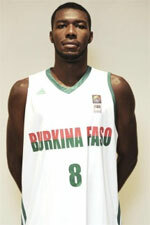 He also represented Burkina Faso at the Afrobasket Championships in Abidjan (Ivory Coast) five years ago. Zerbo's team got to the Semifinals and his stats at that event were 7 games: 3.7ppg, 4.6rpg. Zerbo has played previously for two other teams: Gravelines Dunkerque and STB Le Havre.